The first big freeze of 2017 here in N. Florida has left me with a lot of damage in my tiny garden. 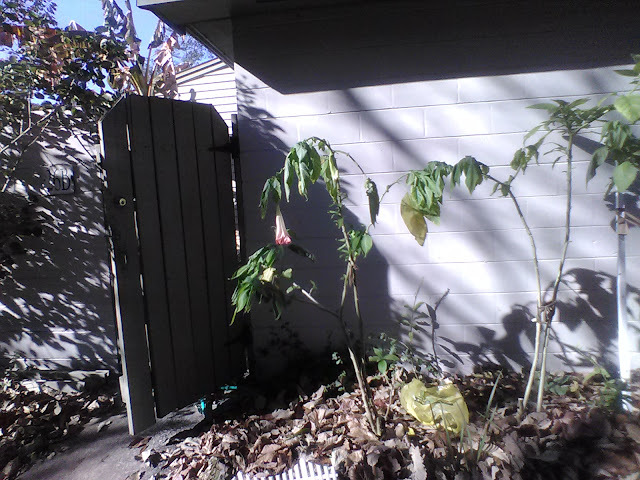 I didn't cover anything but one brugmansia with a seed pod on it, because I wanted to see just what could survive a freeze and what couldn't. It seems that the courtyard does not offer as much protection as I had thought, but the south facing fruit wall garden doesn't seem to have had much damage at all, just like last year. Strangely enough, the Cherokee Purple tomato is badly wilted, while the Supersweet 100 next to it seems fine so far (see pic above). Luckily, I have a couple of rooted suckers from the CP, so I can replant that once it gets warmer. 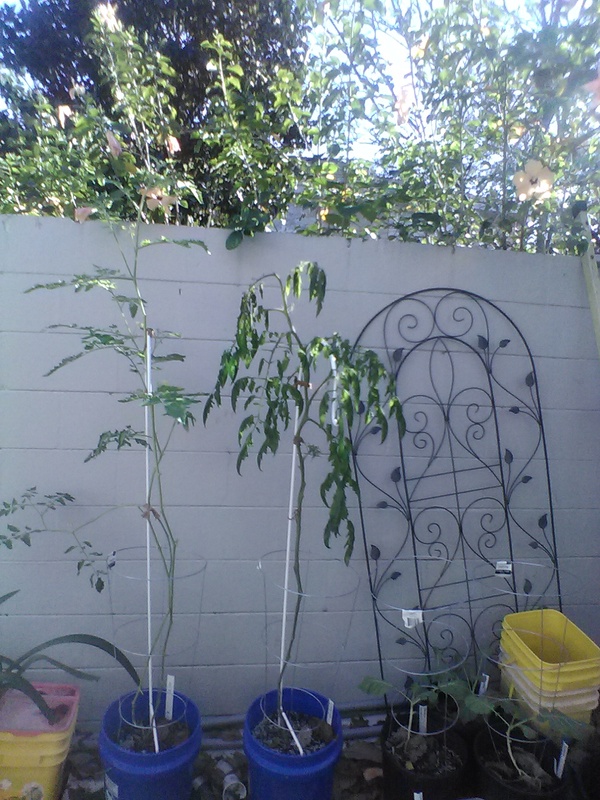 By the way, that trellis to the right is one I picked up from beside the dumpster. It has a broken leg and is a bit rusted, but I can fix all that and it will be pretty with some Cardinal Climber planted on it, from seeds I rescued from a plant down the road just recently. 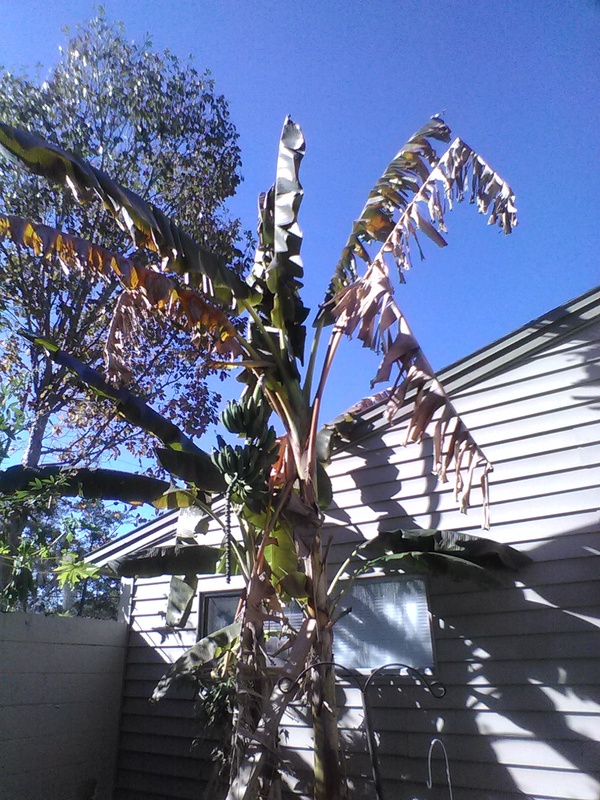 The banana plants sustained major cold damage to the leaves, but I won't know about the fruit until it either turns black and falls off or continues to grow. I don't see how it can survive another cold night, though, and we have many more to come this winter. It would have been nice to have bananas, but it wasn't meant to be. Tender plants in the courtyard, such as the Phillipine Spinach are wilted, but the milkweed looks fine. I think this is the last hurrah for the giant elephant ear, though. It usually goes completely dormant after the first real freeze, so no great loss there, since I'm taking it out this year anyway. The collards and kohlrabi are fine, if still growing at a snail's pace, and the kohlrabi refuses to bulb. The only plant I covered was the brug with a seed pod, and it still wilted. I cut one limb with a seed pod off and have it in water in the house. I may do the same with the other seed pod branch, because I'd really like to get some seeds. Some parts of the brugs have wilted leaves and some don't One is defiantly still blooming. They normally die to the ground and reemerge in spring, and they are going to come out and be moved anyway, so I'm not too worried about them. The oyster plants in the brug bed border all have frozen foliage, which is to be expected since they are Z10 plants, but they have leaves piled around them, so they may come back from the base. I've had that happen many times before in SW FL during freezes. Still, I will probably go dig up and pot the largest clump and cover the others with pots tonight. The hibiscus seem to be fine, and are still blooming this morning. I'm sure after another night of cold, they will likely drop all their flowers, but that's o.k., because I'm planning on whacking those back severely in February. Everything in the bed underneath seems to be fine, save a few exposed frozen leaves of the wandering jew. Even the shrimp plant survived, but I've taken several cuttings from that in anticipation of its death, which will go into the shadiest part of the new butterfly garden this year. Of course, everything in this bed is fine, as usual. Not even the yellow cannas have gone completely dormant. 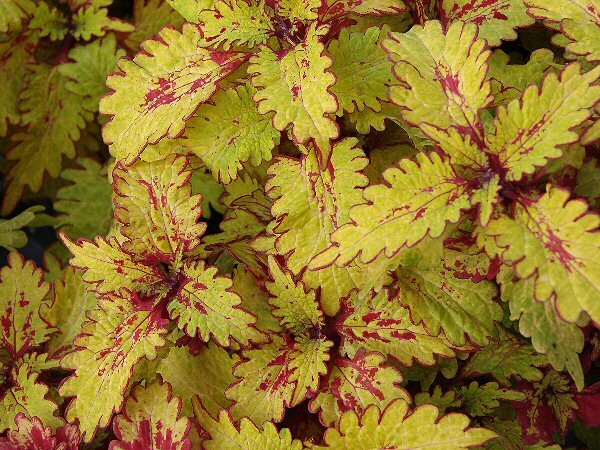 I did see red on the Confederate Rose leaves, and the coleus will probably not survive another night of cold, but that's fine, because it's supposed to go completely dormant anyway. The pigeon pea blooms seem to be frozen, but I can't tell. It's a pretty tough plant. Everything has 3-4 inches of oak leaves protecting its roots, so I don't see anything not surviving the winter, unless we have some strange arctic express or something later on. So that's it for the first freeze. We are expecting even colder temps tonight, so the bananas and tender things will likely not survive, but that's nature. If you enjoyed this post, you can subscribe below and receive email updates for every new post.